Pictured, from left, Commissioner Bob Conley, Devin Van Lue, Carter Bowman, President Cary Groninger and Vice-President Brad Jackson. KOSCIUSKO — County Surveyor Mike Kissinger requested financial assistance for a reconstruction project at the Kosciusko County Commissioners meeting held Tuesday, March 19. The reconstruction project is related to a county-regulated drain called Plunge Creek, located 4.8 miles from North Manchester. Kissinger said the flooding issue has been going on since the 80s but not to the degree that it is now. The flooding issues are currently causing difficulty with accessibility in that area for school buses and emergency vehicles. “It’s becoming a public safety issue now as opposed to just a simple drainage problem,” said Kissinger, who asked about the possibility of county commissioners contributing to the reconstruction project. Kissinger obtained an estimate from the Kosciusko County Highway Department for the cost to raise the road. “I’m just asking if the commissioners would consider, rather than paying the money to raise that road, putting it into the reconstruction which will take care of the flooding problem,” said Kissinger. It was determined that the actual cost to repair the road, a temporary fix, would be $46,410. The cost of the drainage project, which would reportedly solve the issue, is estimated at around $200,000; however, no firm estimate is currently available. Commissioners agreed that the issue of public safety is their main concern. “Our responsibility is to keep the road drivable,” said Vice-President Brad Jackson. After some discussion, commissioners agreed to give $92,820 toward the drainage project. Kissinger said he believes construction would most likely begin in July or August. 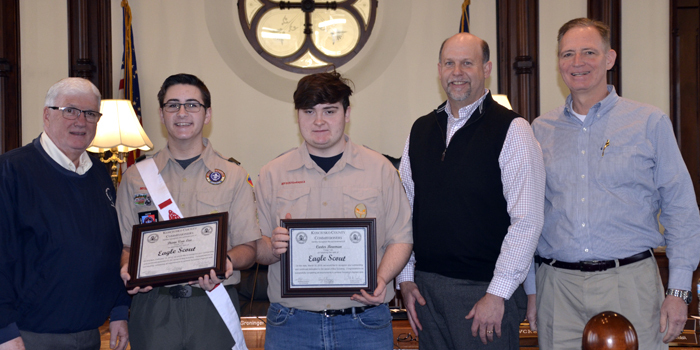 Devin Van Lue, Syracuse, and Carter Bowman, Syracuse, were recognized for achieving the rank of Eagle Scout. Van Lue, a freshman, and Bowman, a junior, both attend Wawasee High School. County Highway Superintendent Scott Tilden requested that commissioners sign a letter of understanding approving an unofficial detour route with Indiana Department of Transportation due to a bridge deck overlay on SR 13 over the Tippecanoe River. The detour will be East CR 500N to North CR 750E, returning to SR 13. This was approved. The bid opening for the bridge #9 project was held at the end of the commissioners meeting. The only bid received was from Rieth-Riley Construction, South Bend, in the amount of $1,838,467.17. According to Tilden, this bid is well over the engineer’s estimate of $1,103,000, with the highest alternative estimate being $1,146,000. Commissioners unanimously rejected the bid. Commissioners signed a request for a 90-day moratorium on large scale commercial solar projects following approval of the Kosciusko Area Planning Commission. A road vacation petition by Chroma Properties involving a private 20 foot roadway in Crow’s Addition, located off Eli Lilly Road in Turkey Creek Township, was approved. Commissioners approved ordinances for the Cumulative Capital Development Fund and the Cumulative Bridge Fund presented by County Auditor Michelle Puckett. A bid in the amount of $17,059 from Core Mechanical Services, Etna Green, for replacement of heating and cooling coils in the Justice Building was approved. Kosciusko Economic Development Corporation CEO Alan Tio gave a quarterly update. County Attorney Chad Miner told commissioners that two items requested by Indiana Department of Environmental Management regarding the Tippy-Chapman Regional Sewer District petition have been addressed, and the petition has been sent to Ice Miller LLC, Indianapolis. The next regular meeting will be held at 9 a.m. Tuesday, April 2.